Finally Google launched the capital in Dhaka, the most anticipated service of Google. This is a Google Map service that provides real-time traffic conditions for major and highways. Google Map has an option named Traffic in the drop down menu. Pressing this, Google will start the traffic. After launching the feature, the level of traffic in different colors is indicated. 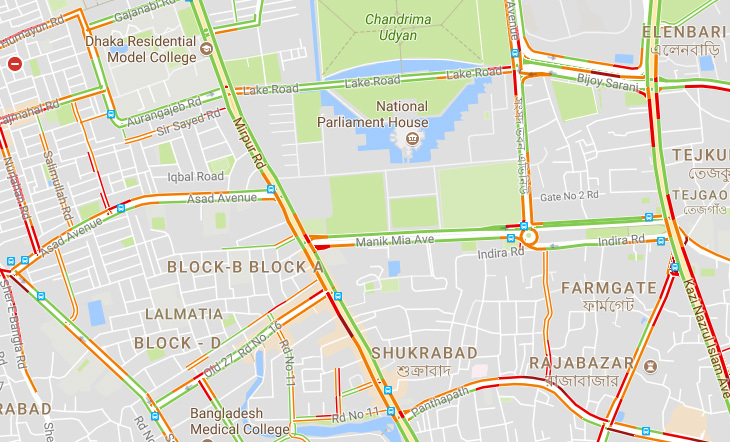 Green color is meant to mean traffic in the street, light with orange color, red with traffic dele and dark red color violent traffic congestion. Using this service, people can easily decide on its journey. According to Business Insider’s report, Google uses Crowd-Source data in this service. That means, the traffic on the Android devices that are on the streets, the location service on Google, collects the traffic data and collects the indicators. And through this the app can figure out the number of vehicles in the street, how fast the car is running and how fast the cars are going.